The Board of Trustees of Wabash College on Saturday unanimously elected Dr. Patrick E. White as the 15th president of the private liberal arts college for men. White, currently the Vice President and Dean of Faculty at Saint Mary’s College, Notre Dame, Indiana, will succeed Andrew T. Ford on July 1. Joseph D. Barnette, Jr., chairman of the Wabash Board of Trustees, made the announcement at the conclusion of the group’s regularly scheduled January meeting. 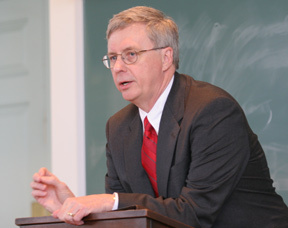 Dr. White also will serve as Professor of English at Wabash. "Wabash is one of America’s greatest liberal arts colleges, rich in tradition and even richer in promise and possibilities," said White. "To be chosen to lead Wabash to new heights of achievement as its next president is a great honor. I look forward with energy and passion to work with the men of Wabash, their extraordinary faculty, staff, and administrators, the incredibly talented and dedicated alumni, and the deeply committed Board of Trustees in order to enhance Wabash College’s greatness, its leadership among liberal arts colleges, and its influence in the world." Ford, now in his 14th year as president of Wabash, announced last May his intention to step down at the conclusion of the current academic year. A search committee, chaired by John N. Fox, Jr. and comprising trustees and faculty and including an administrator, alumni representative, and student body president, was formed in May and made its final recommendation to the Board of Trustees on Saturday. "The Board is delighted to announce that Patrick White will be the 15th president of Wabash College," said Barnette. "I commend the diligent work of the search committee, whose thorough work produced an excellent pool of candidates. The Board believes Dr. White’s passion for the liberal arts, track record as an administrator, and his enthusiasm for the students of Wabash are qualities well suited for Wabash’s next president." 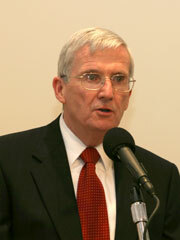 Dr. White has served as Vice President and Dean of Faculty at Saint Mary’s College, Notre Dame, Indiana, since 2002. 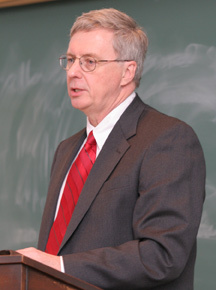 Previously he was the Associate Dean of Faculty from 1988 to 2002, and is Professor of English. He has spearheaded a number of academic initiatives at Saint Mary’s, including establishing the Center for Academic Innovation and the creation of grants, which support collaborative research between faculty and students and among the faculty members themselves. Dr. White was also one of the designers of Saint Mary’s Center for Women’s InterCultural Leadership, a Lilly Endowment-funded initiative. Prior to his service at Saint Mary’s, he served as chair of the Department of Language and Literature at Pfieffer College (1985-1988) and taught at Westmar College from 1976 through 1985. He graduated with honors from the University of Chicago in 1971, and earned his master's and Ph.D. in English and American Literature from the University of Iowa. Dr. White and his wife, Chris, have two daughters, Katie and Molly, who are juniors at Saint Mary’s College, and a son, Paddy, who is a graduate of the University of Chicago and is currently a third-year medical school student at Indiana University. Chris is a certified family nurse practitioner, who is a Clinical Assistant Professor, teaching community health nursing at Indiana University South Bend. "In making its recommendation to the Board, the search committee was most impressed by Dr. White’s calm, thoughtful demeanor and his sense of Wabash’s mission of transforming the lives of the students who enroll here," said Fox, who chaired the committee. "We value the leadership he has shown in developing innovations in teaching and learning and in faculty and faculty-student research. He embraces our high standards for excellence in teaching and our passion for an environment that places students at the heart of the learning environment." Ford (left), Wabash president since 1993, led the college to unprecedented growth in recruitment and fund raising, while spearheading a physical transformation of the school’s facilities. Ford drove Wabash’s recently completed Campaign for Leadership, which generated $136.1 million for the development of student and faculty programs and the construction of a $30 million biology and chemistry building; $7 million renovation of the college’s mathematics, computer science, and physics facilities; the construction of the $20 million Allen Athletics and Recreation Center; the construction of the $2 million Malcolm X Institute of Black Studies; and the new construction or renovation of five of the college’s nine residential fraternity houses. Further, under Ford’s leadership, Wabash established the Center of Inquiry in the Liberal Arts at Wabash College, funded with an initial grant of $20.8 million from Lilly Endowment Inc. and further funded in late 2005 with an additional $12.5 million. "Saint Mary’s and Wabash are in one important way very different," added White. "Wabash is a college for men; Saint Mary’s, of course, a college for women. But both share a respect for students, a commitment to education of the whole person, and a calling of all students to greatness. At Wabash, I will work to articulate the special virtues of a Wabash liberal arts education, what this college for men has to offer students, the world of higher education, and American culture and society." Founded in 1832, Wabash is a liberal arts college for men whose mission is to educate men to think critically, act responsibly, lead effectively, and live humanely. One of three men’s colleges remaining in the United States, Wabash boasts a student body of 871 students and a privately managed endowment totaling over $320 million.